2019 online form submission is www.yvudoa.in. Online applications will be available from 23-03-2019 and last date apply online for Yogi Vemana University Post Graduate Common Entrance Test 2019 is 26-04-2019. Candidates who are completed intermediate they are eligible for 5 years integrated M.Sc Courses and who qualified degree in the pattern of 10+2+3 or in 12+3 or in 11+1+3 they are eligible for regular PG Courses. Written exam for this YVUCET 2019 will be conducted from 13-05-2019 to 16-05-2019. 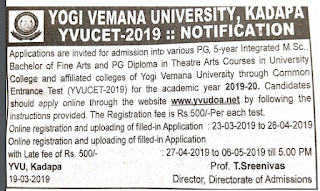 YVUCET 2019 Hall Tickets, Exam pattern, YVUCET Counseling dates and more info Yogi Vemana University Post Graduate Common Entrance Test 2019 is updated below. Bachelors degree qualified candidates are eligible to apply Post Graduates courses Yogi Vemana University Common Entrance Test. For 5 years integrated course intermediate qualified candidates are eligible. Written exam for this YVUCET 2019 will be held for 100 Marks. YUVCET 2019 duration is 90 Minutes. YVUCET 2019 Hall Tickets will be 7 days before the exam date. 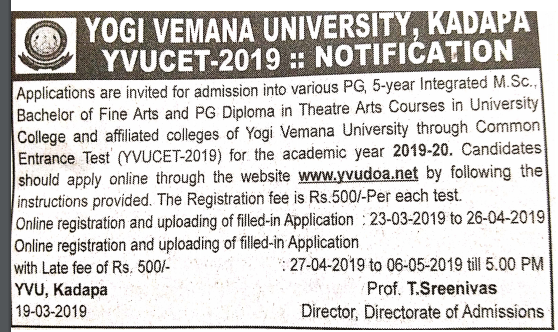 Candidates who wanted to join in post graduation courses in Yogi Vemana University they can apply online for YVUCET 2019 on or before 30-04-2019. Official website to apply online is www.yvudoa.in.